The robbery took place at Peterhead town centre at around 1.40pm on Thursday. Police are hunting "heartless" thieves after two poppy charity collection tins were stolen from a town centre. 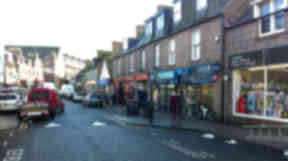 The theft took place on Broad Street, Peterhead, at around 1.40pm on Thursday afternoon. Officers are looking to trace a man and woman who were seen in the area at the time of the robbery. Although it is not clear exactly how much money was taken, police say the overall total could reach a three-figure sum. PC Ross Dewar, who is leading enquiries, said: "We would particularly like to trace a man and woman who were seen in the Broad Street area of Peterhead at about 1.40pm. "The man is described as being around 5ft 2in, of a medium build and was wearing dark clothing. "The woman is described as being around the same height, of a medium build with dark brown shoulder length hair and spoke with a local accent. "Any theft is inexcusable but to steal money from charity is particularly heartless. "Enquiries are ongoing to identify those responsible."